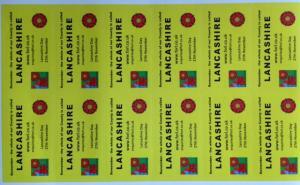 Friends of Real Lancashire have updated their peel off labels for use on envelopes to promote Lancashire. The 12 (100 x 55 mm) yellow labels with black writing, FORL and Red Rose logos on them come on a A4 page and can be stuck onto envelopes. 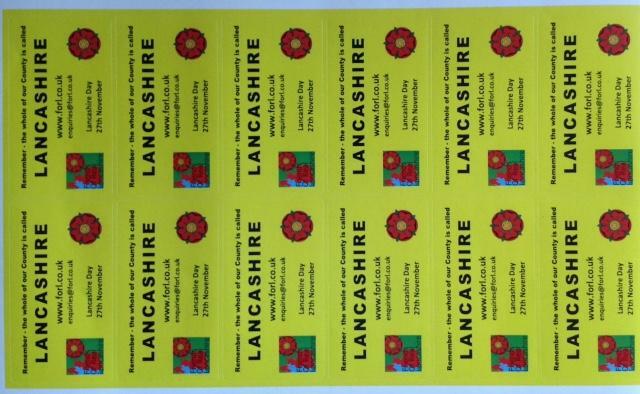 The label say - Remember the whole of our county is called Lancashire, the FORL web site and contact email address and Lancashire Day 27th November. Available now on the website at £5 for 5 sheets, plus postage and packing at normal rates.